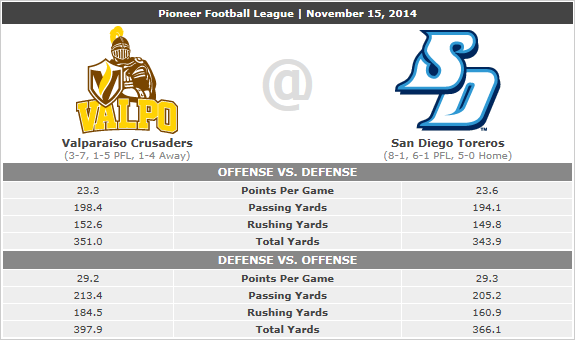 San Diego Football Network: Video: Dale Lindsey prepares Toreros for "PFL title game"
Video: Dale Lindsey prepares Toreros for "PFL title game"
The University of San Diego Toreros (8-1, 6-1 PFL) will be looking for it's eighth straight victory when the Valparaiso Crusaders (3-7, 1-5 PFL) come to town fresh off a 17-3 win over instate rival Butler. A win for the Toreros would clinch at least a share of their third league title in four years. If Campbell pulls off an upset at Jacksonville, USD would earn the outright title and a berth in the FCS Playoffs.